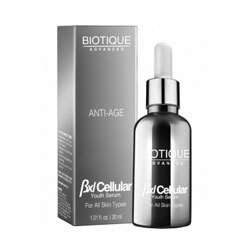 BXL Cellular Youth Serum is an ultra-concentrated formula that lightens and brightens skin tone, as it balances, tightens and firms skin. Smoothes away dry lines, fades dark spots and helps eliminate highly pigmented cells from surfacing with revitalizing 100% natural botanical extracts. Powered by exclusive BXL Complex for the most energizing, nourishing and strengthening skin effects. Apply before moisturizer. Massage a few drops into cleansed skin, AM and PM.